Provide comfort for the family of Charlotte Cooke with a meaningful gesture of sympathy. It is with great sadness that the family of Charlotte Bernice Cooke, 101, of Halifax announces her passing on Monday, February 4, 2019 at Parkland at the Gardens, Halifax. Born in Lunenburg, she was the daughter of the late Charles Edwin and Beulah Georgina (Demone) Zinck. Charlotte started her earlier working career in the family business, E. Cooke’s Grocery on Jubilee Rd., Halifax with her husband, Emanuel and then later went to work in the Gold Room at Mill’s Brothers for 18 years. Over the years Charlotte enjoyed her time as a volunteer in the Gift Shop at the IWK Hospital and was a faithful member of St. John’s United Church, Halifax. 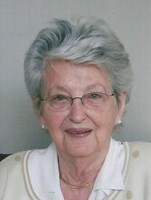 In her spare time she was an avid bridge player and enjoyed quilting for family and friends. Charlotte is survived by her son, Eric (Joan) Cooke, Edmonton, AB; daughter-in-law, Sherry Cooke, Dartmouth; sons-in-law, Keith Allen, Dartmouth and Jim Tudor, Dartmouth, 10 grandchildren and 20 great-grandchildren and many nieces and nephews. She was predeceased by her husband, Emanuel Cooke, daughters, Linda Tudor, Diane Allen and son, David Cooke and brother, Rayburn Zinck. Funeral Arrangements are under the direction of the Dana L. Sweeny Funeral Home, 1213 Hwy. # 3, Lunenburg. A graveside committal service will be held at a later date at the First South Cemetery, First South. In lieu of flowers, memorial donations may be made to the First South Cemetery or to the Canadian Cancer Society. The family would like to especially thank the staff at Parkland at the Gardens for their professional and compassionate care shown to Charlotte. To plant a memorial tree in honor of Charlotte Bernice Cooke , please visit our Heartfelt Sympathies Store. Graveside Committal Service for Charlotte will be held at a later date at the First South Cemetery. Charlotte was a dear friend of my mom, Octavie Tobin , and a relative of my father ,Clayton Tobin, and a telephone friend of myself, Patricia Tobin Lopinski, of NJ. We always enjoyed dinners at her place, she was a wonderful cook. She was a beautiful person inside and out, and will be greatly missed. My condolences to the family. 18 months ago, when our mother was admitted to Parkland at the Gardens, Charlotte and her dear friend Anne Bradshaw took Mom under her wing, making her feel welcome and helping her integrate into her new surroundings. she did this naturally, without any encouragement from anyone, clearly demonstrating a compassionate and generous heart. From the moment I met Charlotte, I was drawn to her brilliant smile, kind words, her gentle and genuine nature. She will be desperately missed by her friends and the staff at Parkland. Please accept my sincerest condolences on behalf of my mother and me.